Some people look at panels and think “This is cheating. It takes no skill at all to make a quilt with a panel. It is someone else’s art.” I think you can look at the following quilts and agree that those statements could not be further from the truth. Panels are extremely useful and beautiful aspects of fabric that have their place in our art form. There are a lot of creative ways to cut apart a panel to make a beautiful and complicated pieced quilt top that any quilter can be proud of. Many panels are already set up as blocks, that you can cut apart and add sashing, cornerstones, whatever you want. You can really make it your own expression of art! This is an attic window by Layna. These can be tricky to do and Layna did a masterful job. The panel is perfect for this pattern, as it really feels like you are looking through a window at a world in bloom. She quilted this with the square spiral pantograph. It adds a lot of texture, but does not distract from the piecing. Donna used the Bolero pantograph on this piece. Besides the panel, she has the coordinating fabrics alternating in the center of the black and gold squares. The bolero quilting design looks like the windy path the butterflies might take between flowers. I also like the rippled texture that this pantograph adds to quilts. So pretty! This panel was cut into strips and then Donetta added sashing between to create a larger quilt. A simple border, and voila! You have the perfect little lap quilt that is going to look perfect in her hairstylist friend’s salon. And how perfect is the bubble design board for this? You can just imagine a salon with bubbles in the air where all these comical ladies work. Here’s another example of cutting up a panel into individual blocks. 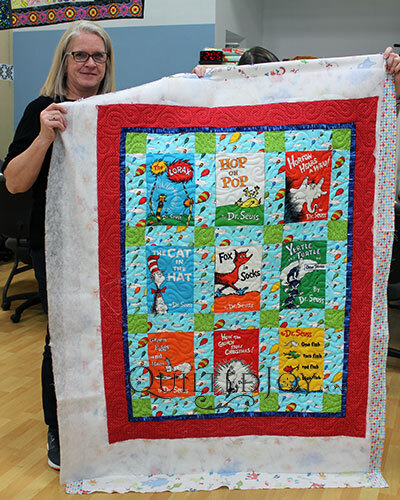 Mary quilted this cute little homage to the amazing Dr. Seuss. It looks like she’s got most of his popular books represented, or at least my favorites. She quilted this with Bolero as well. That pattern really can look good with most anything you put it on. It is just an easy going meander. The next time you look at a panel, don’t think about it as what it is right now. Think about what you can do to make it your own art. That is the beauty of quilting. Cutting apart a panel to make into something more than it originally started out to be. Next post: I’ll be a Guest on Pat Sloan’s Podcast!